Solid whites are available to order. Hello, let me introduce myself,my name is Annette Platten and I have been a registered breeder of cats for over 50 years. I started breeding Siamese and Abysinnian cats in 1964 Joined Governing Council in 1965 and have been a member of two other Governing Bodies and decided to return to Gov in 2014 "where it all started for me" 50 years ago. It feels "good to be back where "it all began for me". I have over the years bred longhair cats and Manx, however I came upon the Scottish Fold Breed around 20+years ago, and have continued my love story with both long and shorthair folds ever since .Despite the current negative 'politics' involving this breed I will continue to breed and show this delightful breed as long as I am well and able to do so. All my cats and kittens come with a Health and Temperament Guarantee. Kittens come from Parents who have been tested. I am currently mentoring four new breeders in four different states. My Desire is to cement this wonderful breed firmly in the public domain before I 'leave' this Planet. All my kittens come with lifetime support and I am happy to share my experience and knowledge with new Ethical Breeders, who love the breed as I do. I currently breed and show Both Scottish Fold and British Shorthair, which are the only outcross recognised by all Governing Bodies that register Scottish Folds. I also breed and show the Scottish Shorthairs, successfully. I will continue to support these breeds as long as possible. After all these years I cannot envisage a life without my cats. For more information call Annette Platten - Tobias Cattery - January 2016. 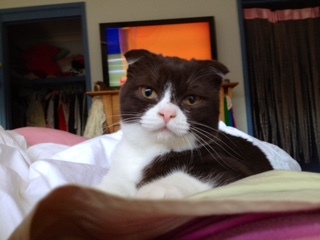 Please note I am now accepting orders again for Scottish Folds, Scottish Shorthairs and British Shorthair. Please contact me by email anytime or by phone between 5-7 pm any day. As you will be aware I specialise in White Scottish folds with Odd Eyes, Gold Eyes Copper Eyes and Blue eyes. As well as Chocolate and Lilac. As well as the traditional Blues, Creams Tabbies,Bi COLORS and Pointed.